Tradesman Signup | Create A FREE BookaBuilderUK Member Profile & Start Receiving Leads Today! We find work for you so you can focus on the things that make you money. Accept and respond to jobs right from your mobile. "I can honestly say that I have tried many different ways of advertising but so far this has been the best by far. I have only been with these guys a couple of weeks and have already had around 20 leads." More work - We find work for you so you can focus on your trade. 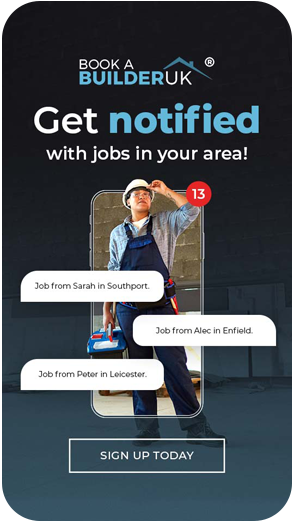 Less hassle - You can accept, decline or respond to jobs right from your mobile. Exclusive member discounts - Members of BookaBuilderUK receive exclusive discounts on many business essentials, including insurance! Fair - We only allow up to 6 of our members to respond to leads ensuring you are always seen by the potential customer. Look great online - Member profile with work photos designed to generate you leads. "I have been with Bookabuilder for six months and my company has gone from strength to strength with their help and I have recommended them in the past and would not hesitate to recommend them in the future." Are you ready to create your FREE business profile?